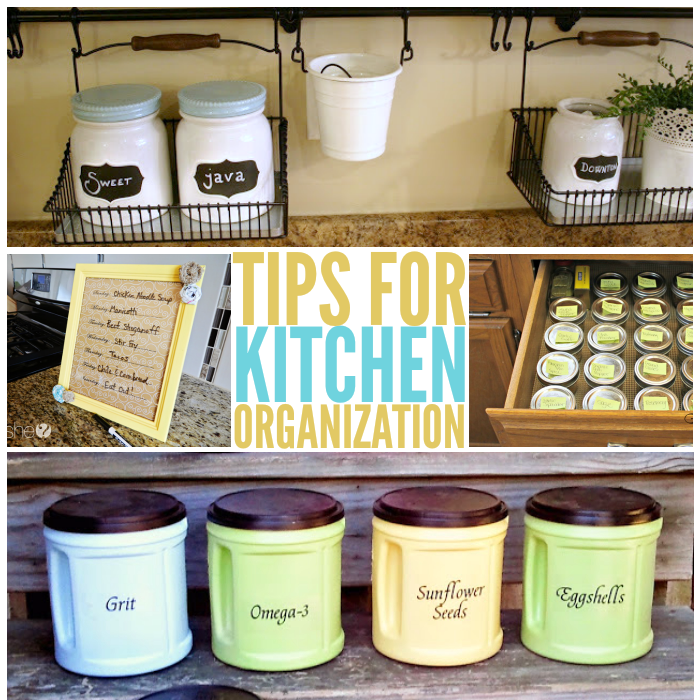 You loved our pantry organization ideas and the post about time saving tricks for the kitchen that we decided to compile some clever ways to organize your kitchen, too. From space-saving hacks to managing your stash of pots and pans, you’re sure to find a few tips to implement in your own kitchen. Under the kitchen sink is often a disaster! Stacking drawers can hold cleaners and other odds and ends, and you can hang cleaning gloves and rags on the cabinet door. Instead of keeping bags of flour, sugar, rice, etc. around, use tall or stackable containers to keep them neatly organized in your cabinets. Don’t want to spend money on pretty containers? No problem! Repurpose old coffee containers and oatmeal cans to create your own. Organization on a dime, literally! Do you have cupcake liners for every season and holiday? Organize them once and for all in a tall, clear container. Tall mason jars work nicely, too. Hang baskets on a tension rod above the counter to keep clutter off your countertops. Are your pots and pans a mess? Straighten them out with a lid rack and a frying pan sorter. No more clanging and banging to find the pan you need! Keep your coffee creamers, sugar, and special flavors organized in a restaurant-style tray. Your family will always know what’s for dinner with this easy DIY menu planner. If you don’t want it cluttering up your countertops, add magnets to the back to hang it on the fridge or put it on the wall. Use Command hooks to hang bulky mixer attachments inside your cabinet. Use storage bins to organize canned foods or to keep kid-friendly snacks within easy reach in the cabinets. Make your own storage bins!! This farm-mom used coffee canisters to create chicken feed containers. 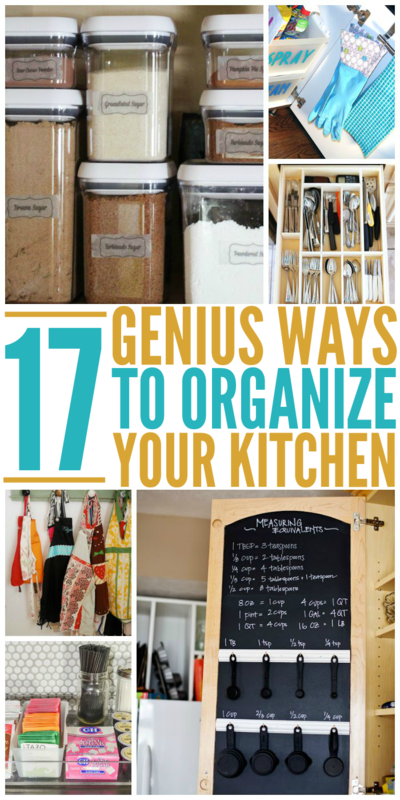 You can do the same thing for your pantry!! Hang your measuring spoons (and a handy conversion chart) on the inside of a cabinet door. Hang aprons, oven mitts and kitchen towels on a pretty wall-mounted coat rack. Store your cutting boards on your cabinet door. Here’s a quick video tutorial on making your own cutting board holder. Keep baggies, boxes of Jello, raisins, nuts, spice packets and other oddly-shaped kitchen items in wire baskets on the back of your pantry door. Put all of your spices in a basket in the cabinet over the refrigerator or range to make use of those often under-used spaces. For a more accessible approach to storing spices, put them in jars in a drawer, and label the lids. Wouldn’t you love to finally get that utensil drawer organized? Here’s a tutorial showing you how to make a custom utensil organizer yourself for only $10. And… saving the bests for last! 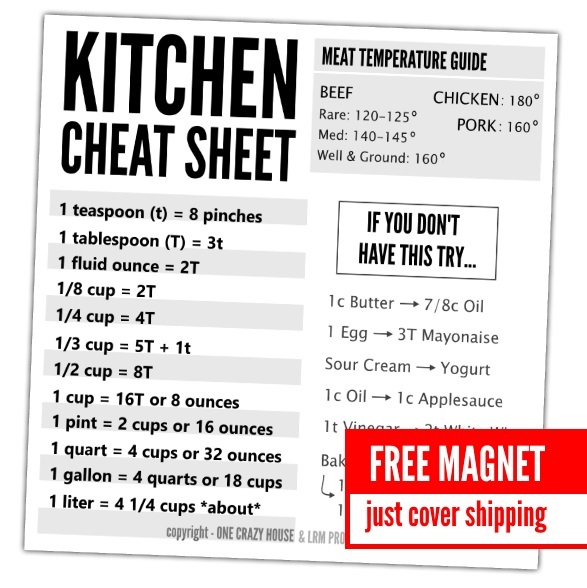 We LOVE having a kitchen cheat sheet handy! It is perfect for those days when you can’t find the tablespoon or need to remember what to use if you run out of oil or whatever! Genius! And it’s FREE!